The second collection of Frederick the Great comics, featuring TWO tales of fop-buckling adventure! In the first, Pablo Picasso enlists the aid of Carl Jung to insert himself into the Collective Unconscious with potentially disastrous results, and in the Second, Frederick must assemble a collection of tertiary historical personages to stop Karl Marx! The first collection of Frederick the Great comics, featuring the famed Gilbert and Sullivan story arc, where the history of Europe as we know it depends on re-uniting the greatest patter-song-generating duo in the history of man! A collection of essays from 2012-2014 about opera and determinism, comic books and 14th century erotica, entomology and humanism, all with an aim to make life a little better, a smidge more joyous, through a steady devotion to Nerd Livin’. 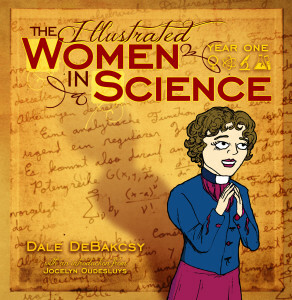 Featuring all 26 female scientists in Dale’s MadArtLab Women in Science series, each with their own biographical portrait written in an exceedingly dashing style, with a comic strip too! 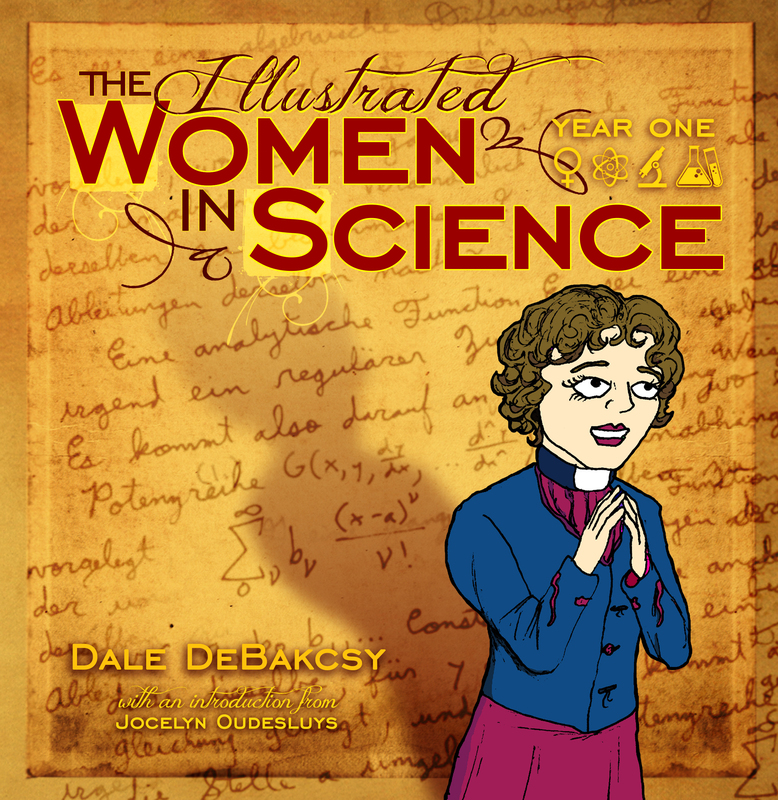 Full-color interiors, an introduction by Jocelyn Oudesluys, and a full bibliography to start your own Women in Science bookshelf – it’s way classy, folks. Frederick the Great, Isaac Newton, Abe Lincoln, and Peter the Great bumble through time, trying to fix historical problems with Absolute Monarch Know-How, and inevitably make everything much, much worse than when they found it. Co-written with Geoffrey Schaeffer! Dale’s series ran at MadArtLab from 2013 to 2016, and is currently to be found at Women You Should Know. A new female scientist every other week, complete with an article exploring their life and work, and a COMIC TOO! Episode 4: Emmy Noether Solves the Universe. Episode 7: Carolynn L. Smith and the Astounding Richness of Animal Communication. Episode 8: Understanding the Lost Children: The Life and Science of Anna Freud. Episode 9: A Voice From the Silent Spring: The Life and Ecology of Rachel Carson. Episode 10: Parity Girl: The Experimental Physics of Chien-Shirung Wu. Episode 11: Hedy LaMarr, The Movie Star who Invented Bluetooth… in 1942. Episode 12: Maria Montessori: When Genius Devours Itself. Episode 14: A Web, not a Road: The Anthropology of Margaret Mead. Episode 15: Mary Somerville, Savior of British Mathematics. Episode 16: Sofia Kovalevskaya: Love Makes All the Partial Difference. Episode 17: Of Gifted Children and the Banality of Menstruation: The Psychological Research of Leta Hollingworth. Episode 18: The Curve Who Became a Witch: The Mathematics of Maria Agnesi. Episode 19: ATLAS Soared: Fabiola Gianotti and the Discovery of a Higgs Particle. Episode 20: The Woman Who Saved Shakespeare and Helped Win Two World Wars: Cryptanalyst Elizebeth Friedman. Episode 21: It Came from Teichmueller Space! The Mathematical Adventures of Maryam Mirzakhani. Episode 22: Summing the Cosmos: Henrietta Leavitt Swan and the Saga of the Cepheid Stars. Episode 23: Our Neighbor Australopithecus: The Anthropology of Mary Leakey. Episode 24: The Secret Life of Hormones: Rosalyn Yalow and the Discovery of Radioimmunoassaying. Episode 25: Saving Oceans by Saving Otters: The Marine Conservation of Sandrine Hazan. Episode 26: Adventures in Chimpland: The Primatology Revolution of Jane Goodall. Episode 28: Unearthing the World Jurassic: Mary Anning and the Founding of Paleontology. Episode 29: Of Artificial Radiation and Natural Genius: The Chemistry of Irene Joliot-Curie. Episode 30: The Monster in Dr. McClintock: The Twisted Tale of Jumping Genes. Episode 31: Making Continents Move: The Ocean Cartography of Marie Tharp. Episode 32: Breaking the Shackles Procreative: Margaret Sanger and the Creation of the Pill. Episode 33: Julia Robinson and the Cracking of Hilbert’s Tenth Problem. Episode 34: Belle Benchley and the Making of the Modern Zoo. Episode 35: Grace Hopper and the Democratization of Computer Programming. Episode 36: Women in Science, the Next Generation. Featuring Lauren Uhde and Her Amazing Friends! Episode 37: Gerty Radnitz Cori: Glycogen to Glucose, and Back Again. Episode 38: Computing Venus: The Astronomy of Maria Mitchell. Episode 39: Lymph, There it is: Florence Sabin, Pioneer Woman of Medical Research. Episode 40: Quantizing the Nucleus: Maria Goeppert-Mayer and the Creation of Nuclear Shell Theory. Episode 41: Corralling the Light Elements: The Nuclear Spectroscopy of Fay Ajzenberg-Selove. Episode 42: Gotta Formalin Em All: The Marine Biology of Eugenie Clark, the Shark Lady. Episode 43: First: The Astrophysics and Astronautics of Sally Ride. Episode 44: Guns N Taxonomy: The Vertebrate Biology of Annie Alexander. Episode 45: Ada Lovelace and the Curious Practice of Programming for Non-Existent Computers. Episode 46: Bringing Teleology Back: Agnes Arber’s Neo-Aristotelian Plant Morphology. Episode 47: Lemurs, Squirrels, and Hyenas, Oh My! The Animal Behavior Research of Toni Lyn Morelli. Episode 48: Hydrogen Rules the Universe: Cecilia Payne-Gaposchkin and the Composition of Stars. Episode 49: Western Science’s Last Gasp Before Dying: Hypatia of Alexandria. Episode 50: More than a Prize Unwon: The Manifold Legacy of Rosalind Franklin. Episode 51: Cyanobacteria and Misery: The Many Hats of Anna Zakrisson. Episode 52: 8 Comets, 2500 Nebulae: Caroline Herschel’s Century of Astronomy. Episode 53: The Queen of Windblown Sediments: Kelly Deuerling’s Aeolian Geochemsitry. Episode 54: The Strangers Within Us: Lynn Margulis and the Rebirth of Endosymbiosis. Episode 55: Primal Screams: Sophie Germain’s Mathematical Labors. Episode 56: Blue Babies with Crossword Puzzle Hearts: The Pediatric Cardiology of Helen Taussig. Episode 57: Vibrating Spiders and Waggling Bees: Madeline Girard’s Multi-Modal Menagerie. Episode 58: Lavinia Waterhouse: Gold Rush Physician, Frontier Suffragette. Episode 59: Capping the Chromosome: Elizabeth Blackburn and the Discovery of Telomerase. Episode 60: Trajectories: Katherine Johnson’s Orbital Mathematics. Episode 61: A Bay of Botany: Alice Eastwood’s Nine Decades and Three Hundred Thousand Specimens. Episode 62: From ATP to MRI: Mildred Cohn’s Pioneering Work in Nuclear Magnetic Resonance. Episode 63: The Billion Roads from Here to There: The Graph Theory Combinatorics of Fan Chung. Episode 64: the tragedy of dian fossey. Episode 66: When Memory Has Gone: The Neuroscience of Suzanne Corkin. Episode 67: Fighting Penicillin’s Monster: Elizabeth Hazen and Rachel Brown. Episode 68: Owner of a Lonely Quark: The High Temperature Quantum Chromodynamics of Agnes Mocsy. Episode 69: The Chemistry of Beauty: Hazel Bishop Betrayed. Episode 70: She Filled the Sky: The Iron Astronomy of Annie Jump Cannon. Episode 71: Wither: The Many Triumphs and Long Fall of Nuclear Physicist Harriet Brooks. Episode 72: Erasing Mileva Maric-Einstein: The Woman Behind Einstein’s Math. Episode 73: Monarch of Crystallography: Dorothy Crowfoot Hodgkin and the Structure of Large Molecules. Episode 74:Before There was Sagan: How Helen Sawyer Hogg Brought Astronomy to the People. Episode 75: Gone, Fission: How Lise Meitner Was Written Out of the Nuclear Age. Episode 76: Octopuses at Work and Play: Jennifer Mather and Cephalopod Cognition. Episode 77: Milk and Blood: Icie Macy Hoobler and the Science of Infant-Mother Nutrition. Episode 78: Generations: The Story of Women in Neutrino Research. Episode 79: Lillian Moller Gilbreth and the Founding of Industrial Psychology. Episode 80: The Enemy is Ignorance: Sylvia Earle Speaks for the Oceans. Episode 81: Legacy, Suspended: Vera Rubin and the Ongoing Saga of Dark Matter. Episode 82: Casualty of Marriage: Clara Immerwahr, Germany’s First Woman Doctor of Chemistry. Episode 83: Making All Nurses Equal: The Many Battles of Estelle Massey Osborne. Episode 84: Jeanne Altmann, Baboon Moms, and the Justice League of Primatology. Episode 86: Margaret Cavendish, Duchess of Newcastle, Lady Gaga of the 17th Century. Episode 87: Mother of the Telephone, Grandmother of Flight, Mabel Hubbard Bell. Episode 88: Dame Stephanie Shirley and the World’s First All-Woman Software Company. Episode 89: Though the Profession Be Against You: Elizabeth Garrett Anderson and the Battle for Women Doctors. 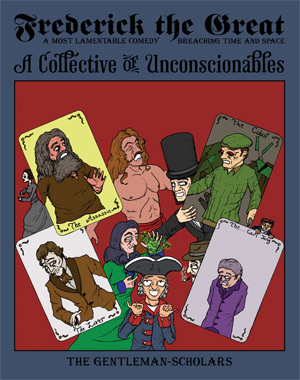 Dale’s Every-Three-Weeks strip at The Humanist investigates philosophers, writers, and ordinary historical folks who have had something crucial to contribute to the progression of humanist philosophy, and the broadening of human perspective. It’s a comic AND a light-hearted romp of an article, all for the price of FREE!. Episode 12: Outprincing the Princes: The Renaissance Diplomacy and Patronage of Isabella d’Este. Episode 13: Farewell, the Soul Immortal: The Reality-First Psychology of Pietro Pomponazzi. Episode 14: Paolo Sarpi: Venice’s Secret Atheist? Episode 15: It’s Beginning to Loki a Lot Like Christmas. Episode 16: From the Midst of Massacre: The Religious Tolerance of King Henry IV. Episode 17: Thomas Hobbes: Materialist. Atheist. Radical? Episode 18: Baruch Spinoza: The Most Dangerous Man in Europe. Episode 19: Hermann Samuel Reimarus: The Man Who Exposed the Apostles. Episode 20: Making Determinism Art: The Humanist Fictionscapes of Denis Diderot. Episode 21: Anthony Collins and the Bad Boys of English Deism. Episode 22: The Royal Road to Enlightenment: Frederick the Great. Episode 23: Voltaire: One Poet Against Christendom. Part One: The Brilliant, Awful Years. Episode 24: Voltaire: One Poet Against Christendom. Part Two: The People’s Hero. Episode 25: We’re All Mad Here. The Seventeenth-Century Tolerance of Pierre Bayle. Episode 26: Novelist. Journalist. Spy. Wit and Sexual Liberation in Seventeenth-Century England. Episode 27: The Reformation’s One Good Man: Erasmus of Rotterdam. Episode 28: Cicero: Classical Skepticism on the Brink of Empire. Episode 29: Keeping it Real: The Pragmatic Religious Skepticism of Niccolo Machiavelli. Episode 30: Reason From Passion: David Hume, the Great Infidel. Episode 31: Becoming Humanism: The Modern Liberalism of John Stuart Mill. Episode 32: Catching up to 260 BCE: The Visionary Humanism of King Ashoka. Episode 33: George, George, and Fanny: Three Nineteenth Century Women Who Invented Twenty First Century Humanism. Episode 35: All Right Then, I’ll Go to Hell: Mark Twain’s Unchained Years. Episode 36: The Writing Dead: Friedrich Nietzsche’s War on Metaphysics. Episode 37: The Ascent of a Man: How Robert Darwin’s Diffuse Son Became Charles Darwin. Episode 39: Woman Resurgent: The Notorious Harriet Martineau. Episode 40: Finding Nothing in the Great Beyond: The Spirit Busting of Harry Houdini. Episode 41: Speaking Science to Fiction: The Present Future of Jules Verne. Episode 42: Douglas Adams, the Universe, and Some Other Things. Episode 43: When Civilization Goes Neurotic: Sigmund Freud’s Theory of Religion. Episode 44: Knowing You As I Don’t: Franz Kafka and the Magnificence of Miscomprehension. Episode 45: Rolling Out the Lazy, Hazy, Crazy Days of Totalitarianism: Hannah Arendt’s Atomized Humans. Episode 46: He Wasn’t There: Nella Larsen and the Harlem Renaissance’s Great Atheist Novel. Episode 47: How to Resist Power: Tips from Bertrand Russell’s Century of Humanism. Episode 48: Woman Manufactured: Simone de Beauvoir’s Subjects and Objects. This webcomic, about a guy who does odd jobs for tertiary deities, ran for 150 episodes and three story arcs drifting through the obscure corners of Norse, Indian, and Judaeo-Christian mythologies. – “Trying Herder: The Lost Voice of the 18th Century’s Greatest 21st Century Thinker” (July 2013). – “Giordano Bruno and the Secret Origins of Modern Philosophy” (September 2013). – “Ludwig Feuerbach, or How to Revolutionize Philosophy and Get No Credit.” (July 2014). – “Recovering From Rorty” (Feb 2015). – “Julia Kristeva: How to Not Mean What You Can’t Say.” (April 2015). – Catherine Malabou Piece (Issue 112). -“The End of Atonement: Justice in a Post Free-Will World” (January 2014). – “Medieval 2.0: The Tragic Return of Collective Guilt” (4th Quarter 2012). – “Some Tricks of the Brain” (2nd Quarter 2013). – “Bullies for Jesus: The Spread of the Good News Clubs” (3rd Quarter 2013). – Katherine Stewart Interview (4th Quarter 2013). – “Athequette: Atheist Etiquette” (2nd Quarter 2014). – “The Dread Word, Purpose” (2nd Quarter, 2015). 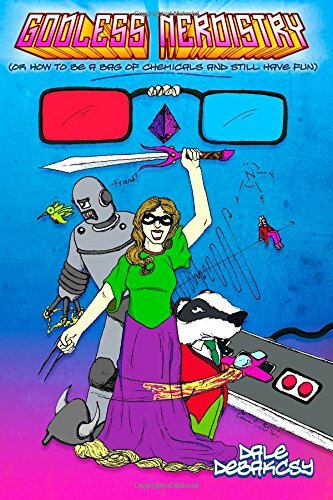 Dale’s short-lived but intensely written blog, covering everything from classical music to Feynman’s lectures to board games to Thor comics to drag queens… pretty much anything he felt like writing about, plus the series Humans Are Great!